New ASE license, valid until Q1 2019 is available in this blog post: ASE License Blog. Please see the instructions below for the correct procedure. 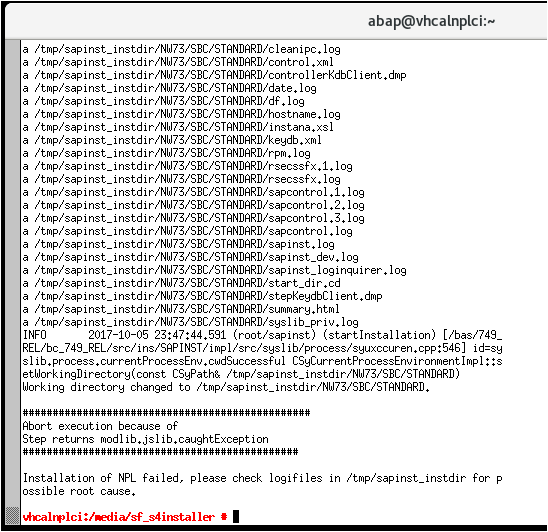 So, you want to install a developer edition of a SAP NetWeaver ABAP AS. It should sit on a Linux distribution, in a virtual box. However, you’re a Linux newbie. We have created a genuine, step-by-step guide, with loads of screenshots to help you on your way. In this example, we will focus on the openSUSe distribution. This guide is part of a series for anyone who wants a free trial version of an SAP NetWeaver ABAP AS. To find out more about this whole series, see SAP NW 750 SP2 ABAP AS Available to Download! Download the latest released version of Oracle VirtualBox from https://www.virtualbox.org/wiki/Downloads for your Operating system. Make sure the relevant ABAP download files (“abap.rar”) are on your local hard drive. Download the correct version of the ASE license from this blog: ASE License Blog and store it on your local hard drive. Important: Choose language and keyboard layout (test keyboard). NOTE: We have only tested the US English-language version. If you have problems, please use the English version. Accept the License Agreement by choosing Next. File System for Root partitionin: choose Ext4 from the drop-down box. (I ticked Use this password for system administrator and Automatic Login. Leave the authentication method and encryption method as they are. Scroll down to find Firewall and SSH. In this section, we will make some settings in the openSUSE system to prepare it for the ABAP installtion: Proxy settings; extract the ABAP .rar files; automount the folder containing these .rar files; install the uuidd daemon; change the hostname; assign root privileges to the install script. Boot up the system by choosing the first option, “Boot from Hard Disk.”Now, we just have these settings before we install the ABAP server. Open Activities and enter “N” as the search term. In the dialog that opens, choose Network Proxy, then choose Manual. Now we want to enter some commands using a tool called Xterm. (Background note: Technically speaking, we are interacting with the shell, a program that passes keyboard commands to the operating system. We are interacting with the shell using a terminal emulator, called Xterm. If these terms are unfamiliar, I would strongly recommend William Schotts’ The Linux Command Line (free PDF)). Again, choose Activities, then enter “X” as the search term. 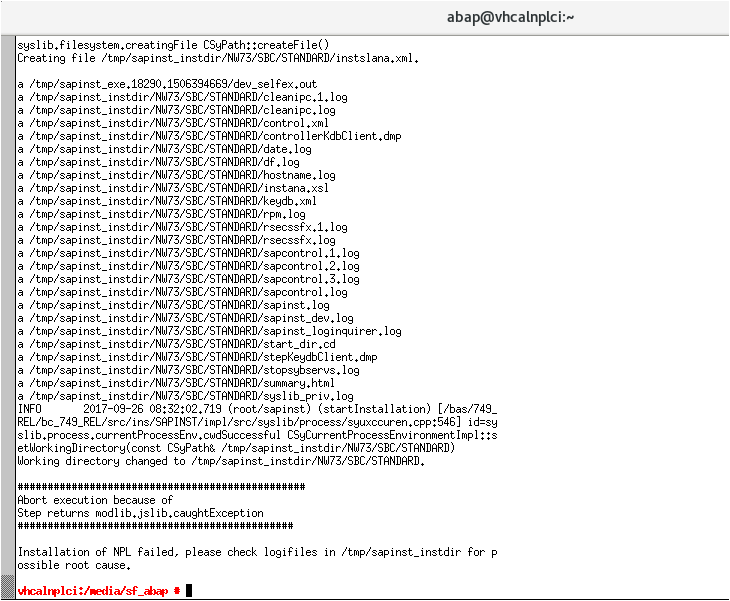 AND NOW…, it is time to download and extract the abap rar files to a local folder. First, so that the Linux system can access this folder, we need to register it for auto-mount. IMPORTANT: Make sure your Linux system is up and running. Select the folder, then choose Settings, then choose Shared Folders. In the dialog that appears, navigate to the folder that contains the ABAP installation. IMPORTANT: Reboot the Linux system. Open the system tool YaST (choose Activities -> enter “Y” as search term…). On the left, choose Software . Scroll down on the right-hand side and choose Proxy. CHange the http settings, tick Use same for all, then test proxy. Now we are going to install the uuidd daemon. Still in YaST, scroll back up and select Online Update. Open the Search tab, and and enter the search term “uuidd”, then choose Search. Select “uuidd”, then choose Accept. YaST will install uuidd, then reboot. Now we are going to start the uuidd service in Xterm. 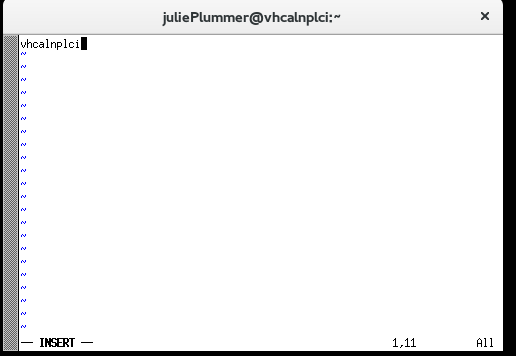 Now, still in Xterm we will change the hostname, by entering sudo vi /etc/hostname. Now we will map hosts to the new hostname. And now, we will assign root privileges, by entering sudo -i. 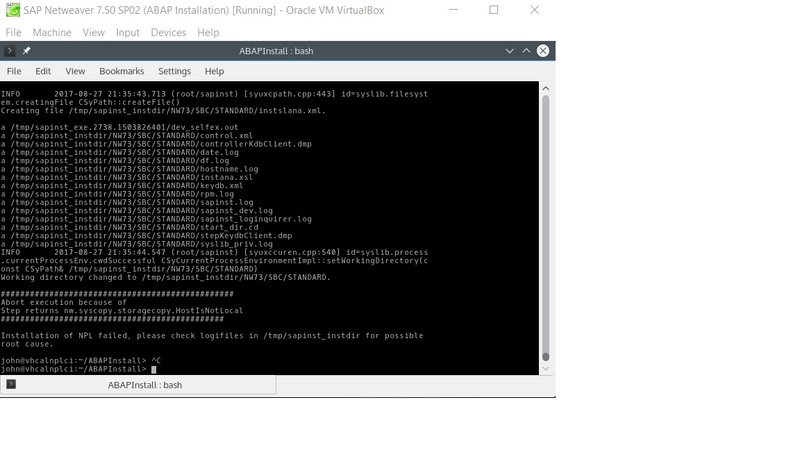 In Oracle VirtualBox Manager, select the VirtualBox with the installed ABAP system on it, then choose Settings from the context menu. From the left-hand menu, choose Network. Open Advanced, then choose Port Forwarding. And that’s it! Hope this helps. Feel free to comment below. We have also provided some additional info (admin, starting / stopping the server, created directories and users, etc) in the Concise Installation Guide. First thing – thanks a lot for this really neat step-by-step guide! I’d be 100% pleased if it acutally worked for me. My problem, at first, was that even if i changed hostname to the one requested it prompted that it’s not complient with standard (after hitting hostname command it prompted the old hostame). Yes i was in sudo when changing – solution was simply restarting linux before proceeding with anything. But before i figured that out i tried with ./install.sh -s – error the same some guys reported – seemingly it couldn’t change “sa” database user password to other. I also tried with -g but stuck on SL Controller started (or whatever that is) and no action. I formatted completely my Virtual OpenSUSE, then before changing anything related to SAP Installation i updated every package installed forcibly by Online update (You can pick all installed packages when prompt is popping up, also You can install uuidd by the way). Then (after proceeding all preparation steps) i tried to install it once again (this time i restarted machine after changing hostnames). This time name convention was checked correctly. So i wanted to install my instance with graphic option. After hitting ./install.sh -g it went out fine until i got a message that no GUI server is installed and it listens on port 21212. So i said “f* it”, let’s give it a try without -g.
The same message popped out – impossible to change username. And without any switch in install command i got the same result – “sa” was the problem for the installer. I think i’ll continue to describe my struggles here, maybe it will help anybody. This time i applied advice from Radek (to supply password – step 21 – not necessarily from Linux itself, but use pattern – small and capitalized letters plus digits without any special characters). I think Step 21 is kinda misleading. I thought at first i have to supply my sudo username over there twice, whereas it’s a SAP Admin and Database Admin pwd. The same error message – cannot change password for user “sa”. I can log into both account on Linux – Database Admin and SAP Admin but i cannot execute on SAP Admin isql command, but there’s a possibility to apply this on Database Admin. Unfortunately there’s some .NET exception occuring – it cannot get connection to database nodes. SAP is literally first bigger program i have problems installing. I think i will give up for some time installing SAP. Resources : at least 4, preferably 6 GB RAM ; 100 GB HD. Copy the new licence file from link: New Sybase License . Need to place this license file in /sybase/NPL/SYSAM-2_0/licenses/SYBASE_ASE_TestDrive.lic. Set the Ownership and Group as per manual attached in the link. I left it for some time and started over now. Here’s the deal. I think i’m just an idiot. I forgot about one simple thing – to install freakig 64 bit java on the Linux. After that installer worked like magic! You can consider adding this to Your tutorial. I feel really stupid now. I always thought Linux comes with Java by default. Thanks for your feedback. I don’t think you’re stupid! Props for owning up. I’ll try to incorporate this. The installation stops (keeps waiting) at the following line. Am I missing anything during the installation? Please help. guiengine: No GUI server connected; waiting for a connection to host vhcalnplci, port 21212 to continue with the installation. Restart your installation. Start fresh with your Suse Installation. Follow the below installation guide point to point. As the database license has expired. You’ll see password failure issue. Take a snapshot at that point. New ASE license is available here: Use this as per the instructions. You should be a root user to copy the specified licence. Now use ./install.sh -g option. From that point. Fresh installation is not necessary. If something fails you start your OS from the snapshot that you have taken. on my OracleVM/SUSE the -g Option does not work. Without this option it was successfull. Another hint if you are new like me with Linux/SUSE: Download the new license File unzipped, without the .pdf file. I used the SUSE Firefox for that. 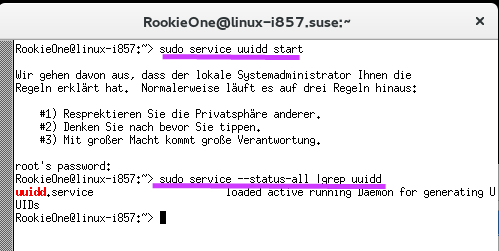 Hmm, yesterday the new SUSE/SAP system was up and running and i have had access with SAP_GUI, But today it aborts after “startsap ALL” with message “no Profil found”. Well… complete new Installation seems to be tricky. I will uninstall SAP/SUSE again like described here in blog and then try the installation guide provided by rathan. Do i need to change rights after replacing it? Or something other to be done? On the logon screen when you login to Suse, switch user to root or enter root for user and login password. Ideally you are in the root now. Navigate to the said folders copy and paste the required licences. You have to change the rights after replacing the file. You can right click on the file and change the permissions. When you check the properties you’ll see the details for a root user (default permissions). Change the users to the proposed names in the license file. Many thanx for your reply. I made complete new installation from th eOpenSAP Guide (which is better) but No User=root available at login screen. Nevertheless i replaced the license file with command… above. Replacing was successful, now checking the rights..
-restore snapshot- and yes.. permissions before replacing are exactly the same. Must be other reason. I think i got it now. Without the -g option. See my post earlier in this thread searching for “In case of complete new installation”. For today it works after restarting. if i get again an error tomorrow i wil post it. Greetings! Thanks for your help. I tried as per your instructions however I am still not able to complete the installation successfully. Do I need to start any GUI server in order to complete the installation. Because the installation stops and waits with the following details; Appreciate your help! Jul 25, 2017 7:54:00 PM [Info]: Reading server configuration. Jul 25, 2017 7:54:00 PM [Info]: Reading service configuration SAPinstService. Jul 25, 2017 7:54:00 PM [Info]: StorageService switched off. Jul 25, 2017 7:54:08 PM [Info]: HTTPManager switched off. Jul 25, 2017 7:54:08 PM [Info]: WebstartService switched off. Jul 25, 2017 7:54:08 PM [Info]: RoleService switched off. Jul 25, 2017 7:54:08 PM [Info]: AlertService switched off. Jul 25, 2017 7:54:08 PM [Info]: NotesService switched off. Jul 25, 2017 7:54:08 PM [Info]: ProcessService switched off. Jul 25, 2017 7:54:08 PM [Info]: MIDService switched off. Jul 25, 2017 7:54:08 PM [Info]: LogService switched off. Jul 25, 2017 7:54:08 PM [Info]: MailService switched off. Jul 25, 2017 7:54:08 PM [Info]: Services started. Jul 25, 2017 7:54:08 PM [Info]: SL Controller started. You don’t have to start the GUI server. When the Installation fails for the first time with password failure issue with an error something like this ““sa” database user password to other”. Did you take a snap shot at this point? If you saved it at this point, Restart your machine using this snapshot. Login as root user into your system. User Name: root password: <yourpassword>. Copy the new ASE licence as proposed in the file. Change all the user permissions as suggested. As you are already in root, navigate to the installation folder after mounting your folder with the installation files if your installation is on another folder. 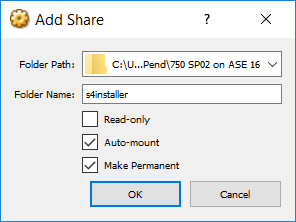 Do a /install.sh -g. After some time SAP Should launch a GUI window so that you can perform installation steps using the navigation and confirmation buttons on the screen. Have you tried out the -g option by yourself on OracleVM/SUSE System with a windows SAP-Gui? I tried it many times including waiting hours for the gui but without success. leaving the -g option -now, this day- seems to do it. After checking rights of the replaced SYBASE license file and renewing SAP license in Transaction SLICENSE the same day like installation and without restarting the SAP. The server is installed on OracleVM/SUSE System. SAP GUI is installed on Mac. First time when I installed I did it without -g.
After replacing the file I did it with -g.
I have tried installing with -g option in SUSE. The installation has failed many times and I couldn’t see the GUI Screen to finish the installation. After some n’th installation I got the SAP Guided Installation steps and it has finished successfully after I set the export DISPLAY=:0 value. I don’t know what made the installation successful. by the way: Installation from before weekend is still running, including start/stop everything. Thanks again Rathan for the very valuable link to this OpenSAP Guide. I did fresh installation and followed all the steps as instructed by Rathan with one change as suggested by Harard (i.e. install without -g) and it worked!!! Thank you so much for your help. You guys are great. I am now able to connect to it from another PC as well. Me too i want to have possibility to connect from another computer. I found some help here in the blog if you search by “how can i connect to my server from different computer”. Two members answered. Have you followed the two answers, both? And.. do you found something else to do? Which version of openSUSE you are using? openSUSE version 42.1 which in mentioned in tutorial is outdated now and I am unable to install UUIDD components now.I have tried this with openSUSE version 42.2 / 42.3 but installation is failing. Once again, can you explain what is missing in the guide, that is available in https://sap.github.io/cloud-s4ext/week-1/unit-6/ ? They should be the same, since I edited one and wrote the other. Thanks a lot Julie. Assertion failed: Unable to generate a new password for database login ‘sa’. Refer to trace file sapinst_dev.log for further information. This is not a linux issue but an installer issue… Any solution/help will be appreciated !! 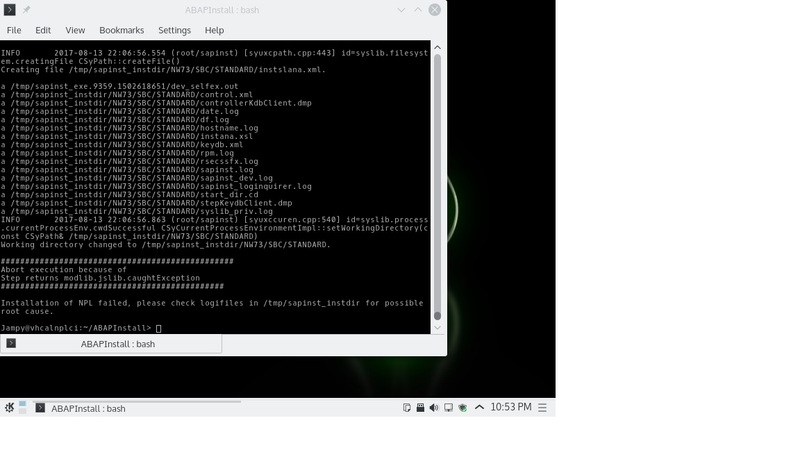 I switch to OpenSuse VM because SAP installation has corrupted my User database and I had to reinstall CentOS…. Assertion failed: Unable to generate a new password for database login ‘sa’. I’m installing on Virtual Box 5.1.24r117012 (Qt5.6.2) on Windows 10. 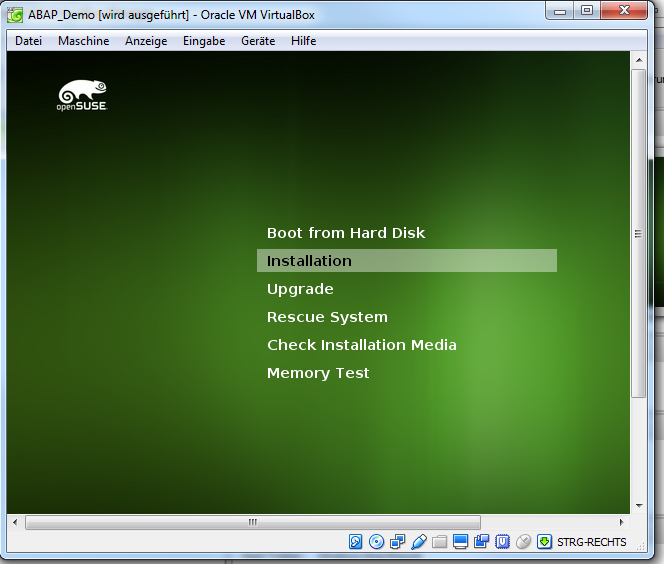 The OS in my virtual box is openSUSE 64 bit as mentioned in this blog. Anybody encountered the same error? Same issue . Tried it multiple times on personal (no proxy) Mac & win10 following instruction to the T with fresh Linux install every time . look like install script errors that have been fixed in past releases that have cropped up again. Unable to determine parameter “DNS domain name”. DNS domain name is not configured in resolv.conf (UNIX) or the registry (Windows) and neither getaddrinfo nor gethostbyname could retrieve it. Unable to set access rights of /sybase/NPL/jre64/lib/fonts/redhat_batang.ttf. Unable to set access rights of /sybase/NPL/jre64/lib/fonts/redhat_dotum.ttf. Unable to set access rights of /sybase/NPL/jre64/lib/fonts/redhat_gulim.ttf. Unable to set access rights of /sybase/NPL/jre64/lib/fonts/redhat_hline.ttf. Unable to set access rights of /sybase/NPL/jre64/lib/fonts/redhat_sazanami-gothic.ttf. Unable to set access rights of /sybase/NPL/jre64/lib/fonts/redhat_sazanami-mincho.ttf. Unable to set access rights of /sybase/NPL/jre64/lib/fonts/redhat_ukai.ttf. Unable to set access rights of /sybase/NPL/jre64/lib/fonts/redhat_uming.ttf. Unable to set access rights of /sybase/NPL/jre64/lib/fonts/suse_batang.ttf. Unable to set access rights of /sybase/NPL/jre64/lib/fonts/suse_dotum.ttf. Unable to set access rights of /sybase/NPL/jre64/lib/fonts/suse_FZFangSong.ttf. Unable to set access rights of /sybase/NPL/jre64/lib/fonts/suse_FZHeiTi.ttf. Unable to set access rights of /sybase/NPL/jre64/lib/fonts/suse_FZKaiTiB.ttf. Unable to set access rights of /sybase/NPL/jre64/lib/fonts/suse_FZKaiTi.ttf. Unable to set access rights of /sybase/NPL/jre64/lib/fonts/suse_FZMingTiB.ttf. Unable to set access rights of /sybase/NPL/jre64/lib/fonts/suse_FZSongTi.ttf. 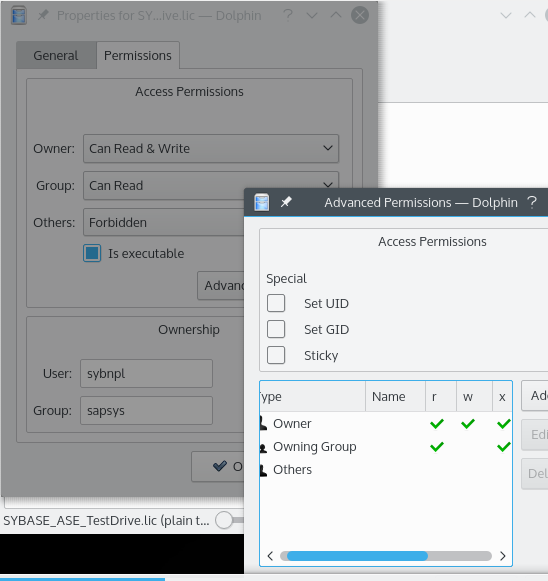 Unable to set access rights of /sybase/NPL/jre64/lib/fonts/suse_gulim.ttf. Unable to set access rights of /sybase/NPL/jre64/lib/fonts/suse_hline.ttf. Unable to set access rights of /sybase/NPL/jre64/lib/fonts/suse_sazanami-gothic.ttf. Unable to set access rights of /sybase/NPL/jre64/lib/fonts/suse_sazanami-mincho.ttf. Unable to set access rights of /sybase/NPL/jre64/lib/fonts/suse_sgothic.ttf. Caught ESAPinstException in module call: Assertion failed: Unable to generate a new password for database login ‘sa’. Refer to trace file sapinst_dev.log for further information.. The step syb_step_reset_db_passwords with step key |offlineadjustment_dialogs|ind|ind|ind|ind|0|0|offlineadjustment_db_post|ind|ind|ind|ind|db_post|0|syb_rename_db_post_dia|ind|ind|ind|ind|syb|0|NW_SYB_DB_REN|ind|ind|ind|ind|syb2|0|syb_step_reset_db_passwords was executed with status ERROR ( Last error reported by the step: Assertion failed: Unable to generate a new password for database login ‘sa’. Refer to trace file sapinst_dev.log for further information.). Fixed with new ASE license file. Are there any changes to the new version installation i.e. 751-SP 02. If yes, could you please update this guide and let me know. Could you retry installation on opensuse as you did it when build this guide, because it doesn’t work now. We are many with the same issue on sa password generation (event with -g option) and I’ve ask to a friend who has succeed months ago and he tried several times and failed with the same issue ! I guess that because the install files are a little too old installation fails. Could you please provide support and answer to this major issue ? Most people with this issue have had an outdated license. Due to community feedback, we have had to focus on the new version, 751, for Teched. For that reason, we were unable to rebuild the whole package with the new license. Should I provide more extensive step-by-step docu for this, or are you happy with the docu? Same goes for me, I retried after a successful instalation before licence expiry. But now installation failed on SA password modification. I tried with and without complex password with max 8 car. Please fixe the installation files. SySAM: Failed to obtain license(s) for ASE_CORE feature from license file(s) or server(s). SySAM: Licenses exist for ASE, but a license containing the configured (PE=EE;LT=AC) attributes could not be obtained. Verify that ASE is configured to use the correct type of license, and either reconfigure; or generate and deploy the desired license from the Sybase Product Download Center. There is no valid license for ASE server product. Installation date is not found or installation grace period has expired. Server will not boot. I am unable to generate license via https://go.support.sap.com/minisap/ web page. Page seems to be down. Does anybody have some problem or is there alternative web page that can be used? Honestly, this NPL Failed error starts to get into my nerves as I’ve been trying to work on the installation for almost a week now. I would like to seek for your kind help to solve this issue. Please anyone could enlighten me what to do. Thank you in advance guys! Working directory changed to /tmp/sapinst_instdir/NW73/SBC/STANDARD. 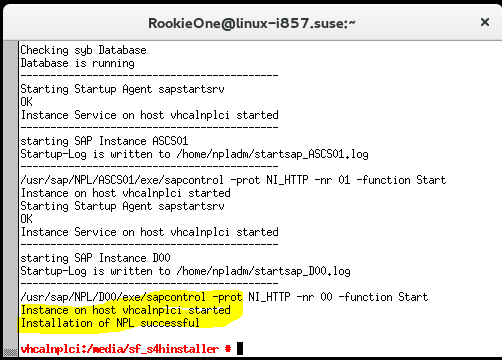 The installation of NPL is failing because, the Sybase ASE Database license that exists in the rar files in https://tools.hana.ondemand.com/#abap (from where we are downloading the SAP NetWeaver AS ABAP Developer Edition), has expired. Download the new Sybase ASE Database license (SYBASE_ASE_TestDrive.lic) from https://mdocs.sap.com/mcm/public/v1/open?shr=dRhHsVYVLc5c1UDveogwtXBdL9m82JccRlvvBXO6K5Q . After unzipping the rar files for SAP NetWeaver AS ABAP Developer Edition, downloaded from https://tools.hana.ondemand.com/#abap, go to folder “server/TAR/x86_64” and take the file “dbexe.tgz-aa“. 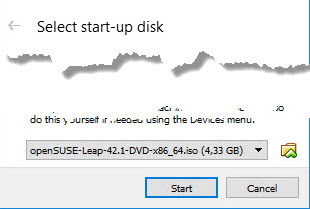 Untar the file “dbexe.tgz-aa” and in the folder “sybase/NPL/SYSAM-2_0/licenses“, replace the existing Sybase ASE Database license (file SYBASE_ASE_TestDrive.lic) with the new licence file downloaded in previous step. Tar the folder again to “dbexe.tgz-aa” file and replace the existing “dbexe.tgz-aa” file with the new one. Use this new folder for SAP NetWeaver AS ABAP Developer Edition, for uploading in the VirtualBox and follow the remaining steps as-is. @Julie – Can you please ask the relevant team in SAP to update the new Sybase ASE Database license in the rar files in https://tools.hana.ondemand.com/#abap, so that everyone do not need to do the above steps. I’ve succeed by pass the ASE license issue but this leads to a invalid hardware key that is not supported by SAP Sneak Preview License Key Request. I really appreciate your reply concerning this issue. I got the license issue sorted out but it look’s like I got another one, do you also have solution for this error? Thank You in advance! I also suggest that you try our new version, just like Julie recommends. Anyhow, you have a problem with your network Setup. Our installer does not discover the hostname to be used bythe system as active on the Installation server. You have to carefully implement the respective steps of Julie’s guide, for either 750 or 751 as appropriate. As such, we are unlikely to have the resources to rebuild the 750. Sorry, I cannot help further – I will let you know if this changes. The install.sh has a check built in that allows you to provide a new ASE license files without the Need to repackage the dbex.tgz file. Just place your new valid SYBASE_ASE_TD.lic file into the Directory where install.sh resides and then execute install.sh. install.sh will update the license file in the license Directory of ASE. We will make a valid SYBASE_ASE_TD.lic available any time soon. Thanks Manfred, I will be updating the docu shortly. I am getting below after performing below steps. Downloaded new file (dbexe.tgz-aa) from the sap portal and replaced with old file. Placed new valid SYBASE_ASE_TD.lic file into the directory where install.sh resides. Could you please help to solve this issue. skip the proxy setting step. You don’t need it. No, it says “IF you have a proxy….”. So dont worry if you don’t- just skip those steps. After many tries I succeed install SAP NW 7.50 Developer edition. Because of the high number of tries I had to do. I’ve created a install guide that helps me to speed up my installs. My installs was failling due to ASE license issue on new install. Now that SAP has just fixed this issue few days ago. My install guide was leading to a success full install. I’ve saved my Virtual Box’s VM (47Gb) at the end of the installation so if anyone want a copy, I’ll create a torrent file (10,5Gb) to download it. Just Ask for it. Yes please, can you link me the torrent file? Thanks for the file. Can you also send the extracted rar folders with the updated ASE license? One more thing, if you don’t mind sharing the access for your user accounts in your VMs that would be great. and as you said this link has expired…. New ASE license is available here: ASE License 2019 – have updated link at top of blog. PS Taryck Bensiali – thanks a lot for all your Community support. I am getting below issue. Could you please guide me to solve the issue. I have followed the same steps (2.1,2.2 and 2.3) as you mentioned in the document. But, still i am getting below error. thank you very much for your very detailed introduction! configuration: “Edit DEFAULT.PFL -> Add parameter : icm/host_name_full = $(SAPLOCALHOST).dummy.nodomain” and restart Netweaver i can’t log in to SAP-GUI. I downloaded and executed your VM (torrent-file) too and I getting the same error. My Client ist on Windows10 installed. VM, i guess is not working because we will many with the same installation ID. I get issue when reusing my own VM. So proper install from begining is the best/recommanded way. Could you provide the check results described in §4.1 ? Because most of the time SAP GUI issue are wrong IP (either in SAP GUI Configuration) or Server configuration. could you ping the server from your sap gui’s PC ? Hello Taryck and many thanks for the quick answer! All points 4.1 (Perform Checks ) are success. As already mentioned: I made a VM by myself (all complete) and later i used your torrent file too. In both cases: I was able to log on to SAP-GUI, activate license and programing ABAP. Only when I set DEFAULT.PFL (icm/host_name_full = $ (SAPLOCALHOST).dummy.nodomain) and restart Netweaver I can’t login anymore. I suspect the problem has something to do with the network settings of my Windows10. Yes and I can connect with root on SSH using MobaXterm. You use 127.0.0.1 for your SAP GUI connexion. Now I solved the problem by editing the profile file /usr/sap/NPL/SYS/DEFAULT.PFL directly with a text editor. Could you please help by providing step by step procedure to implement SAP S4HANA on Oracle VM as openSUSE 42.1 is outdated and I am unable to install SAP on my system? No, I can’t. This forum is for SAP AS ABAP server (dev edition) only. Since we now have 6 blogs referring to 2 different versions of the download developer edition, blog comments are becoming unmanageable. In addition, searching through blog comments is very difficult for other users, resulting in many duplicate issues. Please post on the ABAP Development forum : https://www.sap.com/community/topic/abap.html , using the hashtag #ABAP_Trial. I promise to work through the backlog here, but cannot answer any further questions. 35408798513176413512 used for abap 750 is not the right one to use for abap 751. Would you have the right Developer Access Key for abap 751? I did a few installs (on ubuntu, suse) on the manual step by step, and not 1 installation was not completed. I found a ready-made virtual machine with the NW750, but it also crashed. After installing a clean system, I did not change the network settings and register a static IP only assigned hostname and domain name. I installed nw7.51 with the -s option, everything worked. https://www.sap.com/community/topic/abap/all-content.html , telling us what error you got, preferably with a screen shot? Also, if you include my name, Julie Plummer , then I **should** get a notification. Could you please extend the license file , seems it is expired. Hi Nooruddin – should be ok now. Does anyone have a link to the recent NPL license download page? The old license expired end of march. 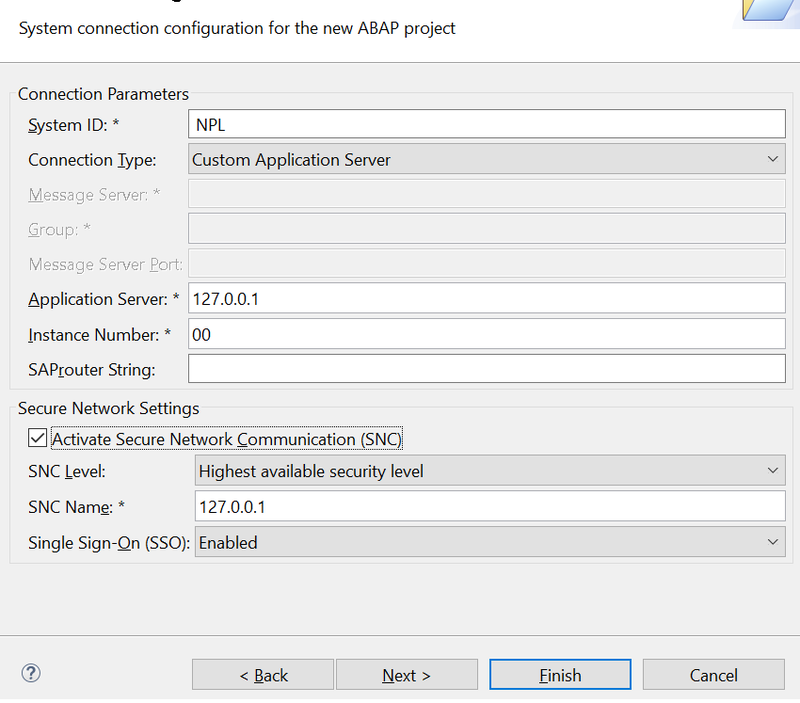 The license you need is not for NPL (ABAP server) but for ASE (database). Please let me know if this works . Best wishes Julie. sorry I did forget to mention. All is up and running. Hi Karl, Good to know thanks! on a Win10 64-bit PC, i7 CPU, 32 GB RAM physical RAM. But the installation script “install.sh” breaks by the error message. Account sybnpl does not exist. Account npladm does not exist. To solve that problem start the installation without using SAPINST_START_GUI option..
To solve that problem start the installation without using SAPINST_START_GUI option..). Even a local SAP Code Jam lecturer had no clue what is wrong, a year ago he succeeded with installation of SAP on openSUSE. He suggested me not to consider the “To solve that problem start the installation without using SAPINST_START_GUI option” hint, as the installation process of the free developer edition is console/text-based only. He was unable to tell me how to apply this tip or whether this tip is useful. Hi Rolf, Thanks for your clear summary. I am officially out of office. But 2 users solved this issue by renewing their ASE license. Can you check yours : it may have expired in March 2018? I am very sorry, but your answer is inadequate. I fail with the installation process prior the application or even installation of a license file. So I dont have any ASE license file installed. as password for my local, non-productive free development SAP server. Is that ok, or might be the reason why the installation breaks ? What kind of passwords are expected and accepted by the script ? Might somebody open a “ticket” ? Or might tell me how to do that, and where ? Trust me: The license may not be valid. The install script checks before completing the install. It is quite possible that you have a different problem; if so, please then let me know. The license check is just the first step. See my other comment for more details. I’m on Oxygen 4.7.1 – it’s recommended but not obligatory. Please update your Eclipse. AFAIK, we don’t provide SNC with the free trial edition. Starting SAP Server after a reboot. Why? I have never had a problem with terminal – could you please provide details? I faced only one issue during the setup process. I received the NPL installation failed error message, even after i renewed the license key using untar > replace license file > tar dbexe.tgz-aa. navigate with nano to license file , directly under dbexe.tgz-aa (no untar needed), copied and pasted new license text then save. I found this fix on youtube. Ah, thanks for the response. I’ll make a note of this. Had somone the same problem an solved it?